More than 40 animals have been moved out of "terrible conditions" in a Gaza Strip zoo to a reserve in Jordan, a welfare group has announced. Four Paws say the 47 animals, including lions, monkeys, peacocks and porcupines, have been taken from Rafah Zoo near the border with Egypt. They were sedated for the journey 300km (190 miles) through Israel, which gave its permission for the transfer. Earlier this year, four lion cubs died at the zoo, which was opened in 1999. Only birds were left behind at the zoo by the group. Two of the lions saved will eventually be moved to South Africa. Four Paws vet Amir Khalil told the BBC the cages had become too small to house the animals. 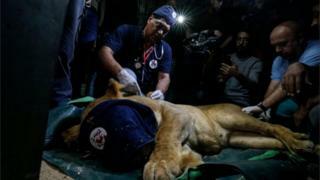 The group drew fresh attention to the suffering of Rafah Zoo's animals earlier this year when a lioness had its claws removed with garden shears so visitors could play with her. Animal rights groups have strongly condemned the zoo's owner Fathy Jomaa for the treatment of the animals. Four lion cubs died at the zoo earlier this year, and Mr Jomaa contacted Four Paws to help move the creatures. Mr Jomaa blamed the Israeli and Egyptian blockades of Gaza, which is controlled by the Palestinian militant group Hamas, and bad economic conditions for the squalid conditions in the zoo. "When we raise a cat for a week or a month we feel sad to lose it but what about suddenly losing animals that I have lived with for 20 years?" he told Reuters news agency. Residents were also sad to see the animals leave. "The zoo is the only place where we could go for a break," Husam Sabawei said. "It was the only place for entertaining our children." Israel's Land Crossing Authority chief said in a statement the country had "used every means at our disposal to help transfer the animals as quickly as possible". Israel and Egypt tightened their blockades of Gaza in response to the Hamas takeover and in an attempt to prevent attacks by Palestinian militants. Correction 8th April 2019: An earlier version of this article inaccurately stated that Gaza is under the control of the Palestinian Authority, and has since been amended.